F Class Submarine: Laid down, as Skate, 21 August 1909, at Moran Bros, Seattle, WA. ; Renamed F-4, 17 November 1911; Launched, 6 January 1912; Commissioned USS F-4, 3 May 1913; Sunk by mechanical failure, foundered of Honolulu, HI, 25 March 1915; Raised, 29 August 1915; Struck from the Naval Register, 31 August 1915; Final Disposition, in 1940 the remains of F-4 (SS-23) were buried as fill in a trench off the Submarine Base, Pearl Harbor. Specifications: Displacement, surfaced 330 t., submerged 400 t.; Length 142' 7"; Beam 15' 5"; Draft 12' 2"; Speed, surfaced 13.5 kts, submerged 11.5 kts; Depth Limit 200'; Complement 1 Officer 21 Enlisted; Armament, four 18" torpedo tubes, four torpedoes; Propulsion, diesel electric, Craig Shipbuilding Co., engines, 800 hp, Fuel Capacity 11,500 gal., Electro Dynamic Co. motors, 620 hp, Battery Cells 120, twin propellers. 409k First Submarine Launch in the Northwest, the F-3 (SS-22), 6 January 1912. In spite of the austere dress, a national ensign and union jack only, the launch of F-3 (SS-22) & F-4 (SS-23) that cold day occasioned enthusiastic celebration along the entire waterfront. Photo courtesy of Seattle Post Intelligencer. 7 January 1912, from the Beneath the Surface: World War I Submarines Built in Seattle and Vancouver by Bill Lightfoot. 78k F-4 (SS-23), photographed in 1913-15. USN photo # NH 74736, from the collections of the US Naval Historical Center. Courtesy of Donald M. McPherson, 1972. 81k F-4 (SS-23), at Honolulu in 1914 along with (from front to back): F-2 (SS-21), F-3 (SS-22) and F-1 (SS-20). The US Army Transport Dix is in the background. 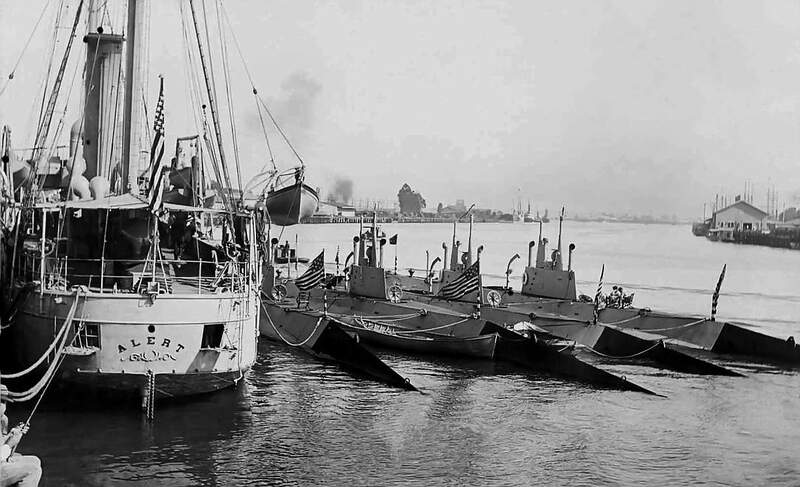 Note the "fish" flags and 13-star "boat" ensigns flown by these submarines. Photographed by Noggle. USN photo # NH 63259, from the collections of the US Naval Historical Center. 124k Tender Alert (AS-4) at Long Beach CA., circa 1914 with several subs alongside. The one next to the Alert is not identifiable, the F-3 (SS-22) second inboard, third boat can't be identified due to flag & F-4 (SS-23) is outboard. Photo courtesy of Vernon P. Maxson, Jr. LCDR,USNR-R-RETIRED (SS) (former crew member, PARGO-SS-264) & Ric Hedman. 478k F-4 (SS-23) on West Point Spit. Most Seattle to Port Townsend traffic avoids West Point. F-4 did not, but no damage was done (except to egos)? The light keeper provided a wooden ladder to facilitate communication. Photo courtesy of Seattle Post Intelligencer. 14 March 1913, from Beneath the Surface: World War I Submarines Built in Seattle and Vancouver by Bill Lightfoot. 408k F-4 (SS-23) on Port Townsend Bay. The canvass dodger has been rigged on the collapsible bridge for these surface trials. The submarine bell rides proudly on the fore deck indicating that F-4 has not yet engaged Quincy Wharf. 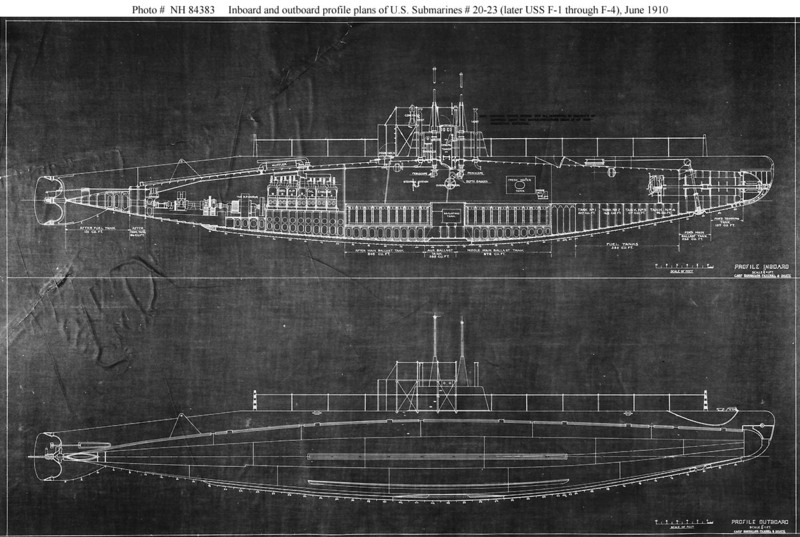 Photo courtesy of Pacific Marine Review July 1913, from Beneath the Surface: World War I Submarines Built in Seattle and Vancouver by Bill Lightfoot. 84k F-4 (SS-23) at left at anchor in Honolulu, HI. 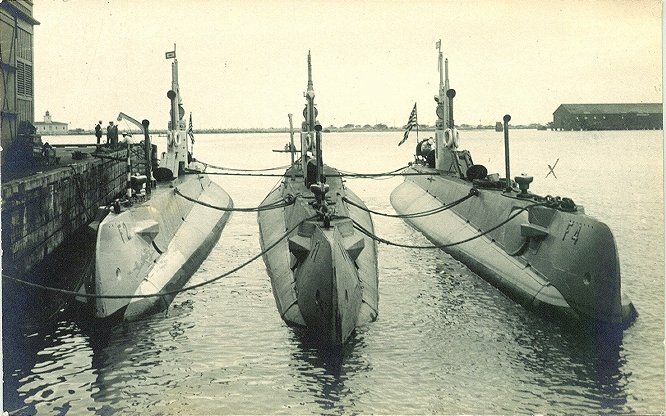 with F-1 (SS-20), center, and F-2 (SS-21) outboard, moored together. Date unknown. Courtesy of MMCM (SS) Greg Peterman USN Retired. Text i.d. from "The Romance of A Submarine" by G. Gibbard Jackson & submitted by Robert Hurst. 296k Four photo postcards showing scenes of the US Navy sailors along with their deep sea diver(s) searching for lost submarine F-4 (SS-23) off the coast of Honolulu, Hawaii on 25 March 1915. Photo & text courtesy of Tommy Trampp. 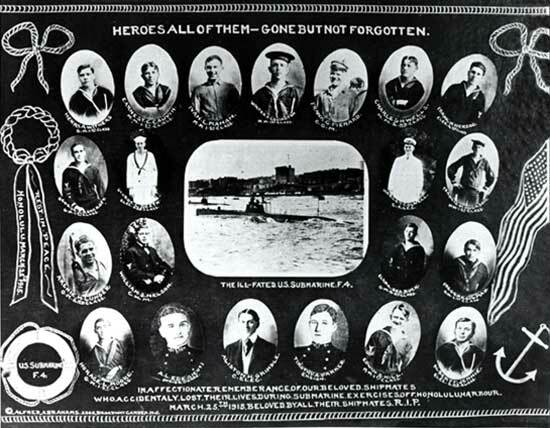 1.01k CITY STIRRED WITH DEEP SYMPATHY FOR MEN OF THE LOST SUMBARINE Image and text provided by University of Hawaii at Manoa; Honolulu, HI. Photo from Honolulu Star-Bulletin. (Honolulu [Oahu, Hawaii) 1912-current, 26 March 1915, 2:30 Edition, Image 3, courtesy of chroniclingamerica.loc.gov. F-4 STILL LOST; SEARCH KEPT UP AND HOPES FOR 21 MEN ARE HIGHER Image and text provided by University of Hawaii at Manoa; Honolulu, HI. Photo & text by Honolulu Star-Bulletin. (Honolulu [Oahu, Hawaii) 1912-current, 26 March 1915, 2:30 Edition, Images 1 & 2, courtesy of chroniclingamerica.loc.gov. 854k SEARCHERS HAVE HIGH HOPES F-4 (SS-23) IS LOCATED; WILL TRY TO RAISE IT. THE SUBMARINE F-4 PHOTOGRAPHED IN HARBOR Image and text provided by University of Hawaii at Manoa; Honolulu, HI. Photo & text by Honolulu Star-Bulletin. (Honolulu [Oahu, Hawaii) 1912-current, 26 March 1915, 3:30 Edition, Image 1, courtesy of chroniclingamerica.loc.gov. 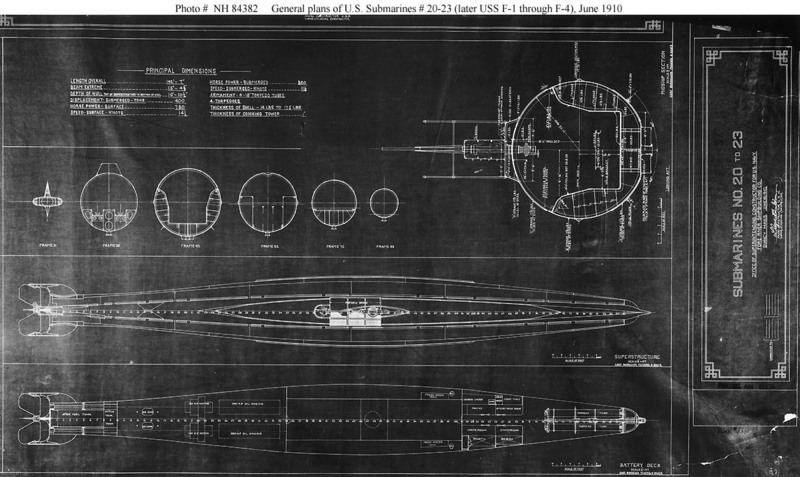 923k F-4 (SS-23) AGAIN GOES TO BOTTOM; HOPE FOR TRAPPED 26 GONE Image and text provided by Library of Congress, Washington, DC. Photo & text by The Washington Herald. (Washington, D.C.) 1906-1939, 28 March 1915, Image 1, courtesy of chroniclingamerica.loc.gov. 1.17k Slow Death In Sunken Submarine F-4 (SS-23). Image and text provided by Washington State Library; Olympia, WA. Photo & text by The Tacoma Times. (Tacoma, Wash.) 1903-1949, 29 March 1915, Image 7, courtesy of chroniclingamerica.loc.gov. 1.12 Fighting Hard against Time, Men Work to Find Buried Comrades Image and text provided by University of Hawaii at Manoa; Honolulu, HI. Photo from Honolulu Star-Bulletin. (Honolulu [Oahu, Hawaii) 1912-current, 29 March 1915, 3:30 Edition, Image 3, courtesy of chroniclingamerica.loc.gov. WRECK IS DRAGGED ALONG IN WATER 60 FATHOMS DEEP Image and text provided by University of Oregon Libraries; Eugene, OR. Photo & text by Medford Mail Tribune. (Medford, Or.) 1909-1989, 30 March 1915, SECOND EDITION, Image 1, courtesy of chroniclingamerica.loc.gov. 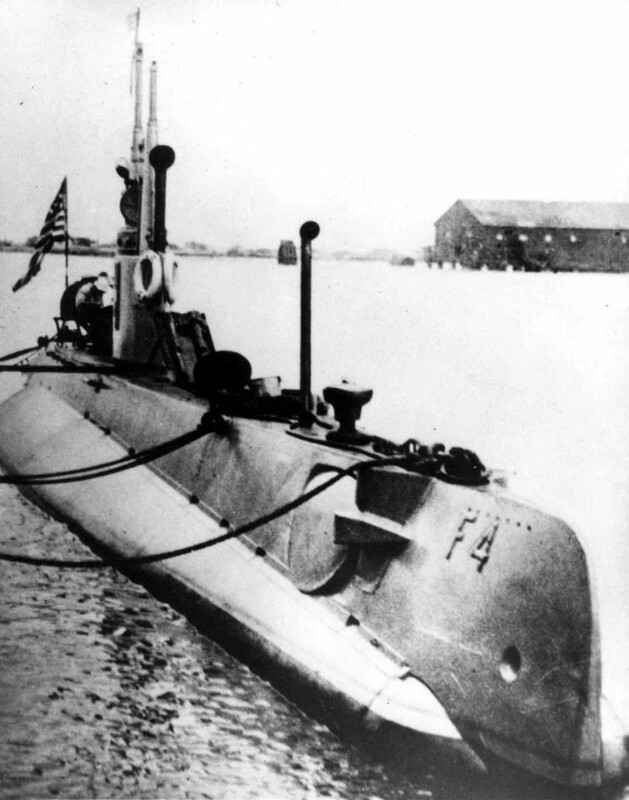 708k AMERICAN SUBMARINE F-4 (SS-23) SINKS OFF HONOLULU; CARRIED CREW OF 25. Great disappointment was felt here when the announcement was made that the searchers for the missing submarine F-4 had thus far failed to locate her in spite of previous statements she had been found and partly raised. 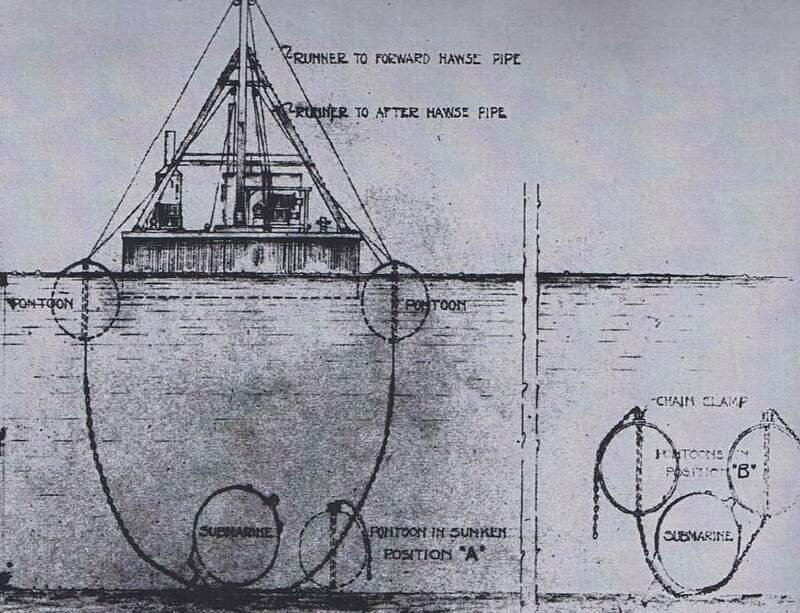 The truth of the situation was revealed by Diver Agraz of the submarine service, who went down 215 feet only to find that the dredging hook was fast to a discarded anchor and not to the lost boat, as had been believed for two hours. Image provided by: Ohio Historical Society, Columbus, OH. Photo & text by The Democratic Banner. (Mt. Vernon, Ohio) 1898-192?, 30 March 1915, Image 1, courtesy of chroniclingamerica.loc.gov. The F-4 (SS-23) as she appeared while under way in a trial run. Image and text provided by University of Oregon, Knight Library; Eugene, OR. Photo & text by Medford Mail Tribune. (Medford, Or.) 1909-1989, 31 March 1915, SECOND EDITION, Image 1, courtesy of chroniclingamerica.loc.gov. Sent to Honolulu from Brooklyn - Trial of Bell Successful Image and text provided by Library of Congress, Washington, DC. Photo & text by New-York Tribune. (New York [N.Y.]) 1866-1924, 1 April 1915, Image 16, courtesy of chroniclingamerica.loc.gov. 614k Views of American Submarine F-4 (SS-23) Sunk Recently at Honolulu. Image and text provided by University of Oregon, Knight Library; Eugene, OR. Photo & text by The Evening Herald. (Klamath Falls, Or.) 1906-1942, 02 April 1915, Image 1, courtesy of chroniclingamerica.loc.gov. 478k American Submarine Lost at Honululu Image and text provided by University of Oregon Libraries; Eugene, OR. Photo & text by Daily Capital Journal. (Salem, Or.) 1903-1919, 05 April 1915, Image 3, courtesy of chroniclingamerica.loc.gov. 814k Newspaper clipping of the loss of the F-4 (SS-23). USN photo courtesy of Scott Koen & ussnewyork.com. 169k Newspaper clipping of the loss of the F-4 (SS-23). USN photo courtesy of Scott Koen & ussnewyork.com. 601k Raising the three ton anchor of the battleship Oregon (BB-03) which was thought to be the missing F-4 (SS-23) when first grappled. Image and text provided by University of Oregon, Knight Library; Eugene, OR. Photo from Medford Mail Tribune. (Medford, Or.) 1909-1989, 08 April 1915, SECOND EDITION, Image 1, via chroniclingamerica.loc.gov. 808k The cause of the disaster to the F-4 (SS-23) in Hawaiian waters was the collapse of the inner shell of the oil tanks in the bow after the hull was crushed on a coral reef. Image and text provided by Library of Congress, Washington, DC. Photo & text by New-York Tribune. (New York [N.Y.]) 1866-1924, 11 April 1915, Image 6, courtesy of chroniclingamerica.loc.gov. 1.04k Cruiser Maryland (ACR-8) and Some Important Apparatus to be Used in Case Divers For F-4 (SS-23) Need Special Treatment Image and text provided by University of Hawaii at Manoa; Honolulu, HI. Photo & text by Honolulu Star-Bulletin. (Honolulu [Oahu, Hawaii) 1912-current, 13 April 1915, 3:30 Edition, Image 1, courtesy of chroniclingamerica.loc.gov. 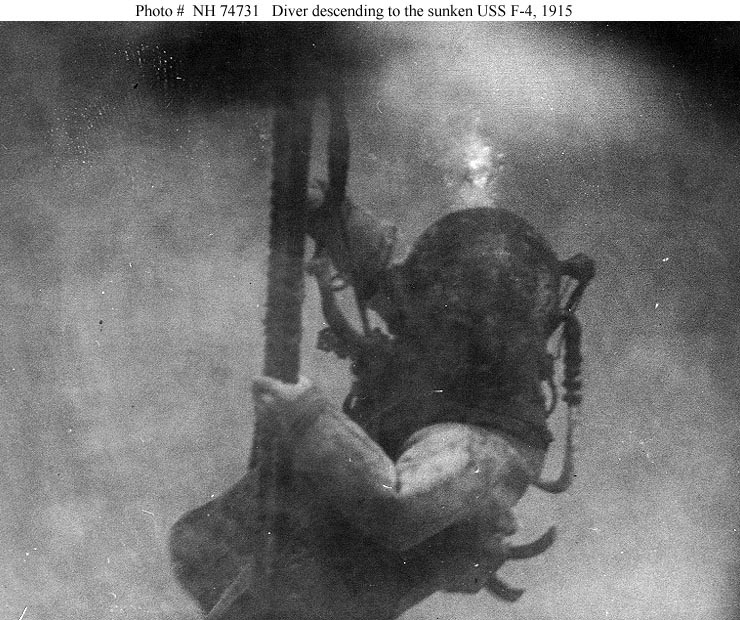 550k Diver "Jack" Adrez going down to search for the F-4 (SS-23), when he had made the record dive of 215 feet. In the foreground on the government dredge brought to the scene for the purpose of raising the submarine, are the crews of the other United States submarines in the Honolulu Harbor. U.S.SUBMARINE F-4 LYING IN HONOLULU HARBOR. WITH CREW, ALL BUT ONE OF WHOM WERE LOST ON DECK. To the Left is the interned German Ship Gier, From a Photograph Taken a Short time Before the Last Manoeuvre Which Resulted in the Loss of the Undersea Fighter Photo by Central News, courtesy of memory.loc.gov. Partial text from The New York Times, 18 April 1915. Page 2. George Crilley (In diver's uniform), who was called upon to locate F-4 (lower picture), which sank with twenty-one in Honolulu bay. Image and text provided by Library of Congress, Washington, DC. Photo & text by The Washington Herald. (Washington, D.C.) 1906-1939, 18 April 1915, PICTORIAL SECTION, Image 28, courtesy of chroniclingamerica.loc.gov. 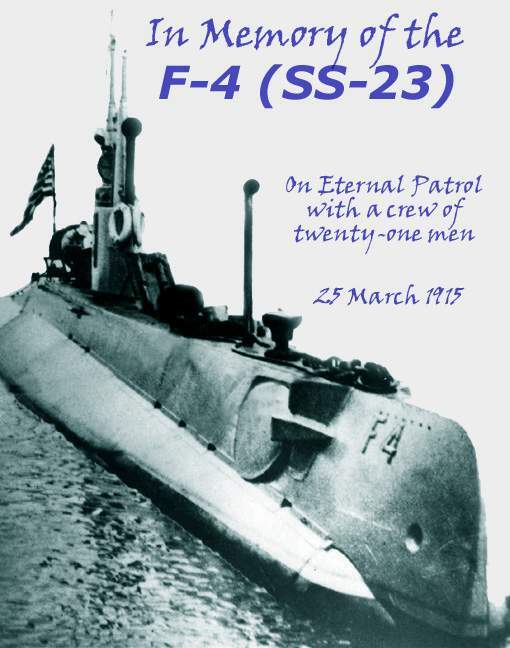 671k VALVES LEAKY, ENGINE BAD, BATTERIES IN POOR CONDITION, WROTE COMMANDER OF F-4 (SS-23) JUST BEFORE SUBMARINE WAS LOST. Leaky valves, engine breakdowns, battery and bad motors were in a letter just received in Los Angeles by Allison S. Ede from his brother, Lieut. 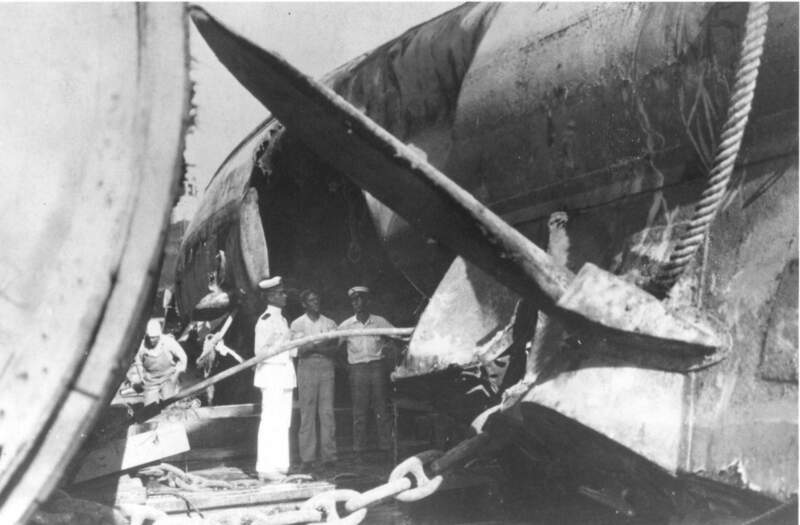 Alfred L. Ede, of the submarine F-4, which sank in Honolulu harbor on March 25, in describing the condition of the boat. A veiled premonition of death was also contained in the letter, which was written three days before they met disaster. The accompanying pictures have just been received from Honolulu. At the right is the last picture ever taken of the F-4. The other photograph shows a deep sea diver leaving a small boat to search the sea depths for the submarine. The photo was taken from the dredge California. Image and text provided by Ohio Historical Society, Columbus, OH. Photo & text by Perrysburg Journal. 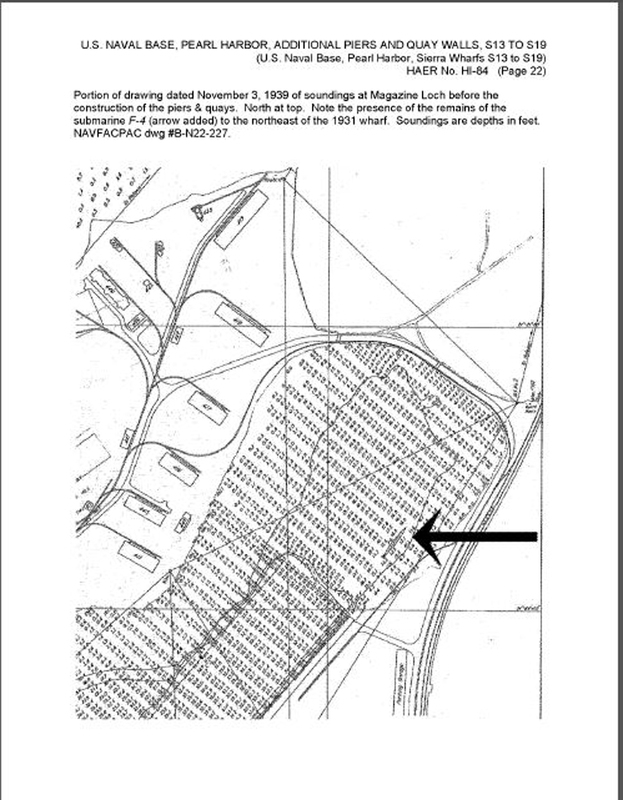 (Perrysburg, Wood Co., O. [Ohio]) 186?-1965, 22 April 1915, Image 6, courtesy of chroniclingamerica.loc.gov. James M. Hoggett, electrician, only survivor of the crew of the American submarine F-4 (SS-23). He was on shore leave when the vessel started on her fatal trip at Honolulu. Image and text provided by University of Nebraska-Lincoln Libraries, Lincoln, NE. Photo & text by Dakota County Herald. (Dakota City, Neb.) 1891-1965, 29 April 1915, Image 3, courtesy of chroniclingamerica.loc.gov. 744k F-4 (SS-23) Divers Set World's Record. Image and text provided by Library of Congress, Washington, DC. Photo & text by The Washington Herald. (Washington, D.C.) 1906-1939, 02 May 1915, PICTORIAL SECTION, Image 31, courtesy of chroniclingamerica.loc.gov. 1.47k How 21 Men Of Uncle Sam's Under-Sea Navy Met Death In Honolulu Harbor? Sunken Craft Had Every Known Safety Device And Distress Signal But No S. O. S. Reached the Surface After Her Fatal Plunge. Image and text provided by West Virginia University. Photo & text by The Sunday Telegram. (Clarksburg, W. Va.) 1914-1927, 09 May 1915, Image 27, courtesy of chroniclingamerica.loc.gov via Ric Hedmen. 957k How Pretty Society Girl Originated F-4 (SS-23) Benefit Image and text provided by Library of Congress, Washington, DC. Photo & text by The Washington Times. (Washington [D.C.] 1902-1939, 16 May 1919, FINAL EDITION, Image 15, via chroniclingamerica.loc.gov. 388k Diver in water for 5 hours seeking submarine F-4 (SS-23). Image provided by: Penn State University Libraries; University Park, PA.
Photo & text by The Evening Public Ledger. (Philadelphia [Pa.]) 1914-1942, 1 June 1915, courtesy of chroniclingamerica.loc.gov. 132k Diver descending to the sunken submarine. Photographed 90 feet below the surface. Photo courtesy of Donald M. McPherson, 1972. U.S. Naval Historical Center Photograph # NH 74731 via Robert Hurst. 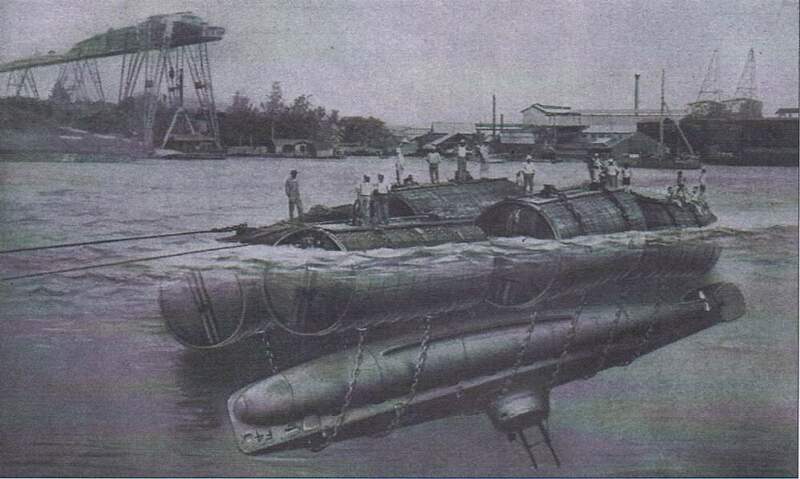 141k Naval Constructor Furer developed this method for recovery of the F-4 (SS-23) from the ocean floor off Honolulu. Six large pontoons were constructed at Mare Island for this project and freighted to Hawaii on the deck of the armored cruiser Maryland (ACR-8). Photo & text courtesy of Beneath the Surface: World War I Submarines Built in Seattle and Vancouver by Bill Lightfoot. 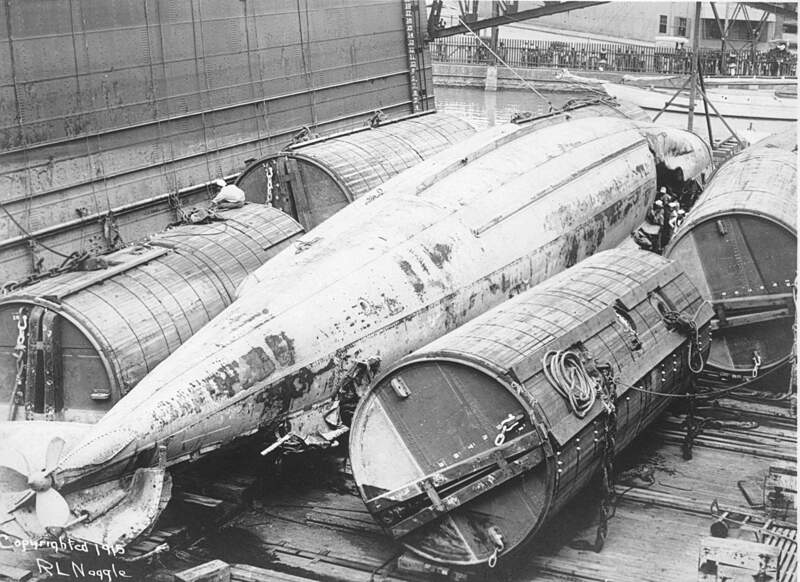 102k Salvage of F-4 (SS-23). 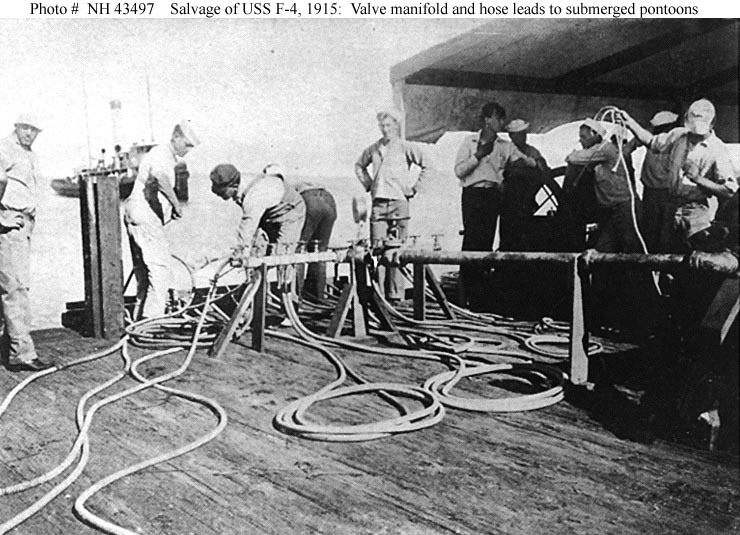 Valve manifold and hose leads to submerged pontoons, on board a salvage vessel off Honolulu, circa 29 August 1915. Halftone photograph, copied from "Transactions of the Society of Naval Architects and Marine Engineers", Volume 24, 1916, Figure 11. The tug is probably Navajo. USN photo # NH 43499, from the collections of the US Naval Historical Center. 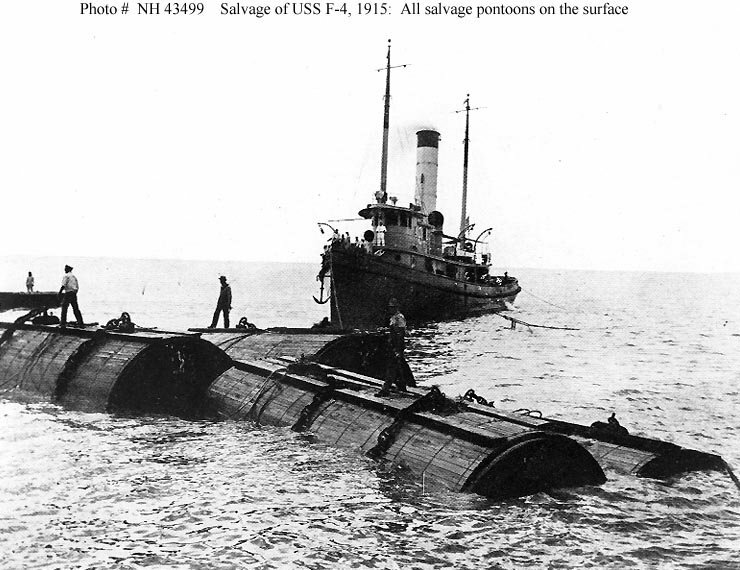 104k Salvage of F-4 (SS-23), April-August 1915. Valve manifold and hose leads to submerged pontoons, on board a salvage vessel off Honolulu, Hawaii, probably in August 1915. This equipment was devised by Naval Constructor Julius A. Furer. Halftone photograph, copied from "Transactions of the Society of Naval Architects and Marine Engineers", Volume 24, 1916, Figure 11. The tug in the left distance is probably Navajo. USN photo # NH 43497, from the collections of the US Naval Historical Center. 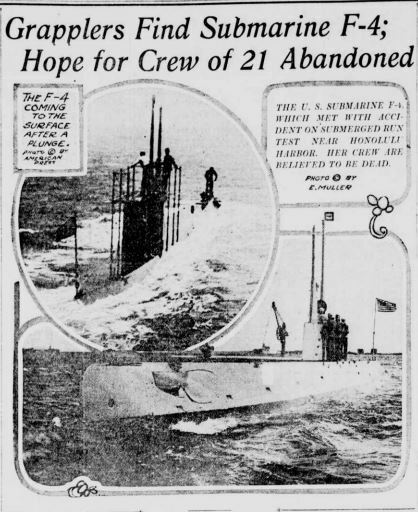 70k Salvage of F-4 (SS-23), April-August 1915. 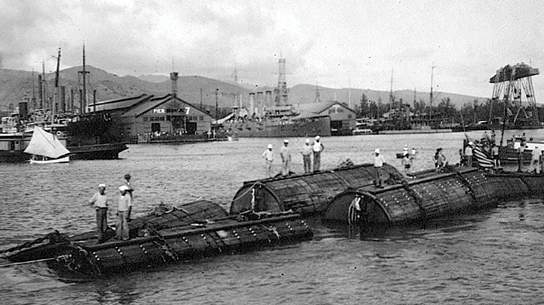 Bow salvage pontoons emerging from the depths, off Honolulu, Hawaii, circa 29 August 1915, during the final lifting of the sunken submarine. The salvage equipment was devised by Naval Constructor Julius A. Furer. Halftone photograph, copied from "Transactions of the Society of Naval Architects and Marine Engineers", Volume 24, 1916, Figure 12. USN photo # NH 43498, from the collections of the US Naval Historical Center. 88k This edited photo illustrates how the F-4 (SS-23) was moved from deep water into the dry dock after being raised from a record setting depth of 320 feet, a salvage record that held for 54 years. Photo & text courtesy of Beneath the Surface: World War I Submarines Built in Seattle and Vancouver by Bill Lightfoot. Photo from Kerrick, Military & Naval America. 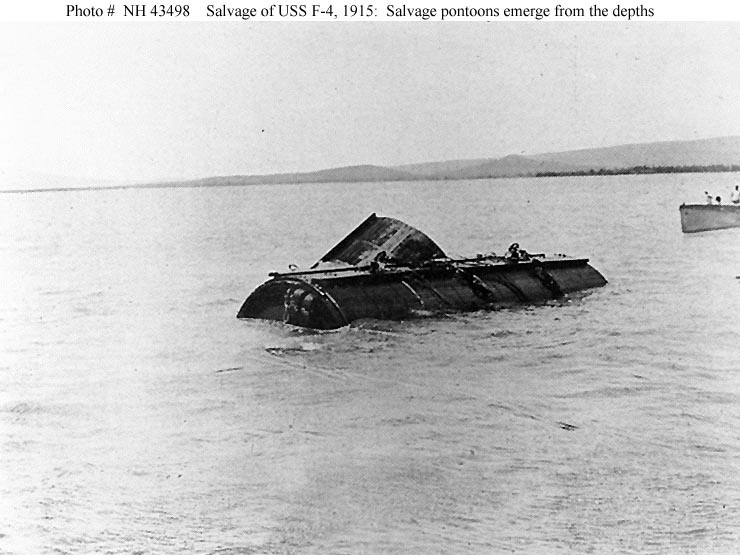 86k Salvage of F-4 (SS-23), circa 29 August 1915. 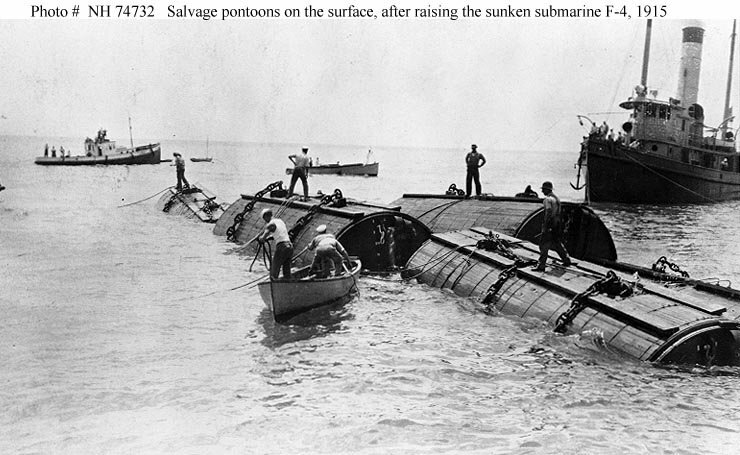 Salvage pontoons on the surface, off Honolulu, after the final lifting of the sunken submarine in preparation for towing her into Honolulu harbor. 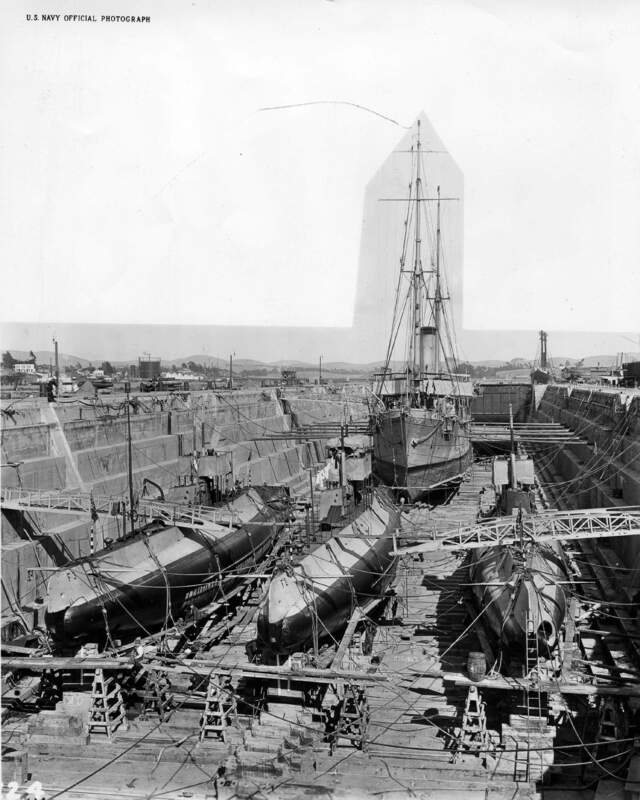 Note wooden protective sheathing around the pontoons. Salvage equipment was devised by Naval Constructor Julius A. Furer. The tug is probably Navajo. USN photo # NH 74732, from the collections of the US Naval Historical Center. Photo courtesy of Donald M. McPherson, 1972. 41k Pontoons used to raise the F-4 (SS-23). Photo courtesy of Jack Treutle (of blessed memory). 31k Harbor scene as the pontoons used to raise the F-4 (SS-23) pass by. Photo courtesy of Jack Treutle (of blessed memory). 622k Pontoons With Recovered Submarine F-4 (SS-23) Underneath Crossing Honolulu Harbor In Tow Image and text provided by University of Hawaii at Manoa; Honolulu, HI. Photo & text by The Hawaiian Gazette. (Honolulu [Oahu, Hawaii]) 1865-1918, 31 August 1915, Image 1, courtesy of chroniclingamerica.loc.gov. 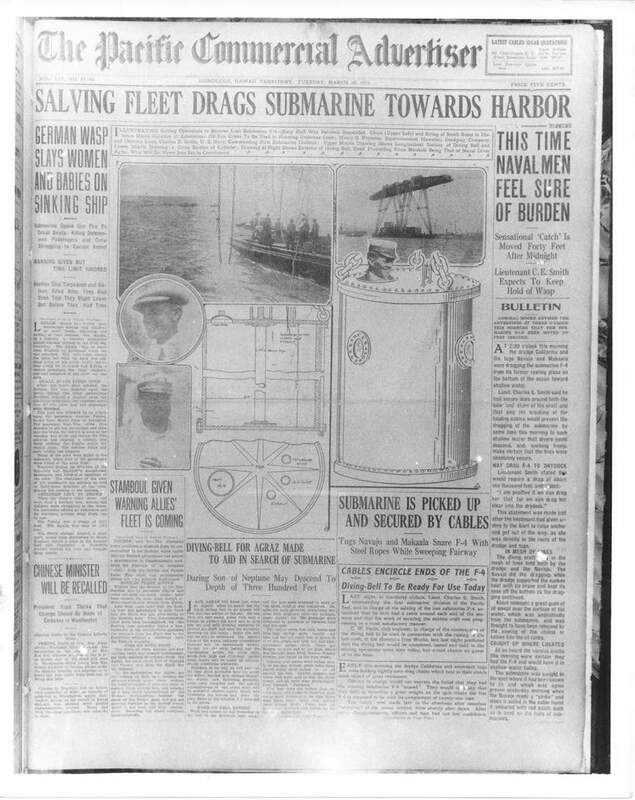 942k SUBMARINE RAISED AFTER FIVE MONTHS ON OCEAN BOTTOM Image and text provided by Library of Congress, Washington, DC. Photo & text by New-York Tribune. (New York [N.Y.]) 1866-1924, 31 August 1915, Image 3, courtesy of chroniclingamerica.loc.gov. Gaping Hole In Side of Submarine Shown as Battered Vessel Lies on Drydock Image and text provided by University of Hawaii at Manoa; Honolulu, HI. Photo & text by Honolulu Star-Bulletin. (Honolulu [Oahu, Hawaii) 1912-current, 31 August 1915, 2:30 Edition, Image 1, courtesy of chroniclingamerica.loc.gov. 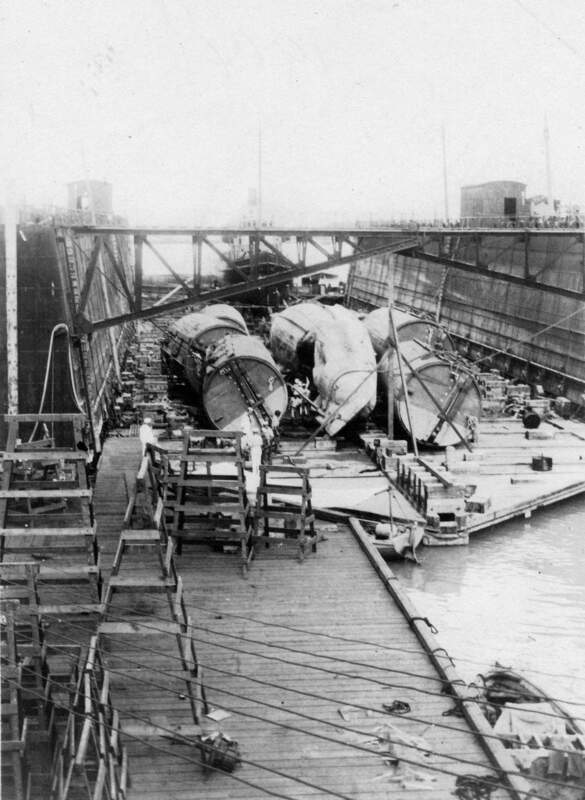 248k The salvaged F-4 (SS-23) sits in a floating dry dock in Pearl Harbor in August 1915. 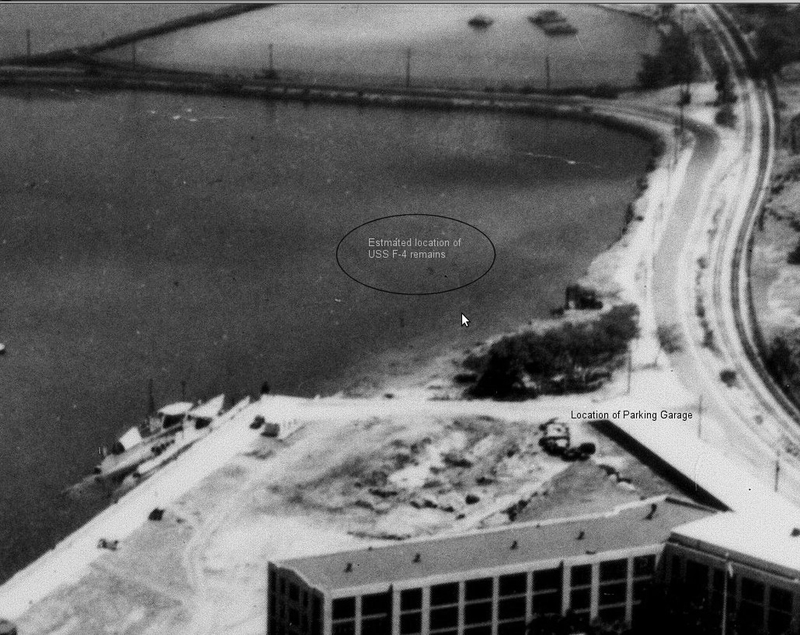 Note: Pontoons beside her were constructed at Mare Island Navy Yard. USN photo courtesy of Darryl L. Baker. 729k The ripped F-4 (SS-23) lies in dry dock next to the pontoons use to raise her. USN photo courtesy of flickr.com via Stephen Gower. 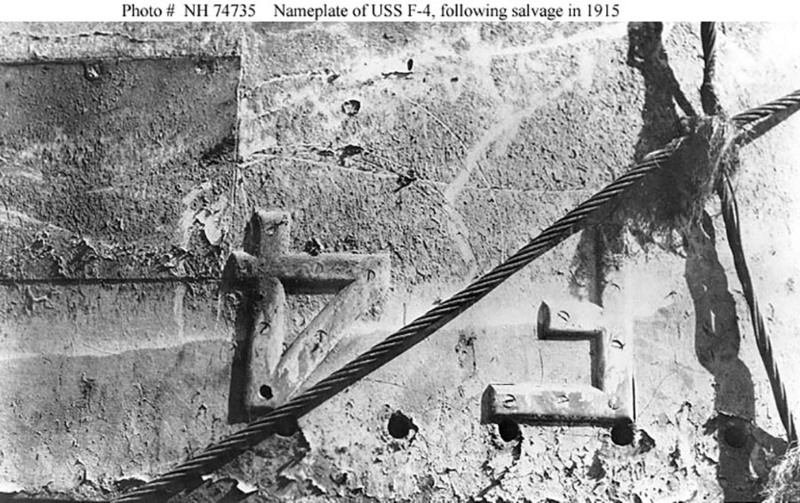 166k View of F-4's (SS-23) port side name plate, taken in drydock at Honolulu, Hawaii, circa late August or early September 1915, after she had been raised from over 300 feet of water and towed into port. 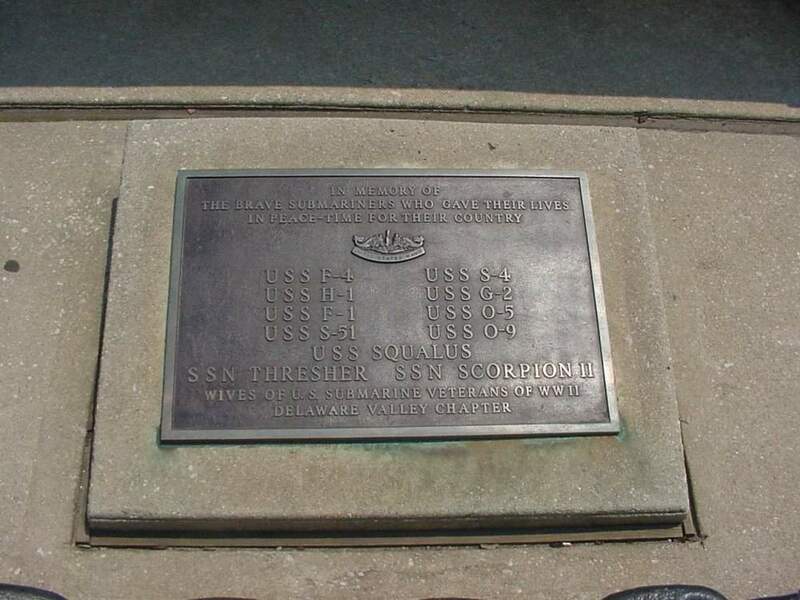 These figures are mounted on the submarine's port bow, and are shown upside down, as she was drydocked rolled to starboard approximately 120 degrees from the vertical. Photo courtesy of Donald M. McPherson, 1972. U.S. Naval Historical Center Photograph # NH 74731 via Robert Hurst. 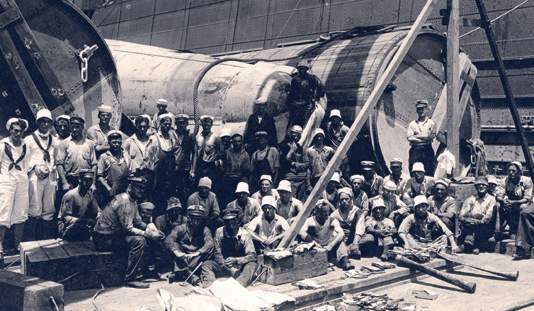 178k Naval personnel examine the large implosion hole in F-4's (SS-23) port side, in drydock at Honolulu, circa late August or early September 1915. She had been raised from over 300 feet of water and towed into port. This view was taken from off the port bow, showing the submarine's port side diving plane in the center. She is upside down, rolled to starboard approximately 120 degrees from the vertical. Text courtesy of photo # NH 74734, from the collections of the US Naval Historical Center. 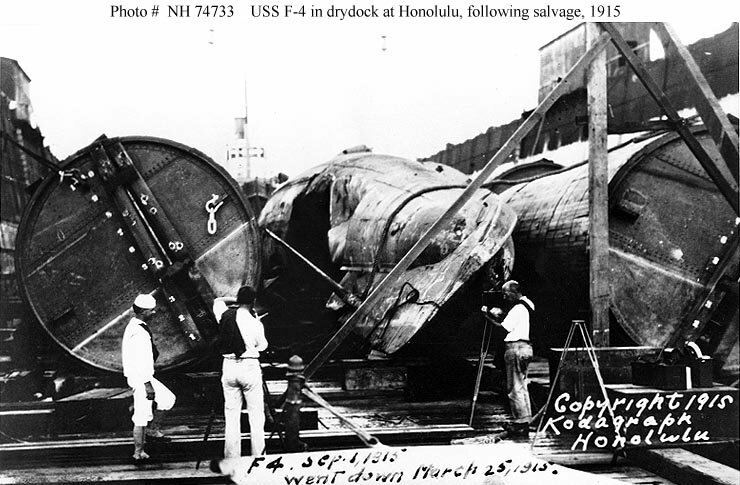 98k F-4 (SS-23), in drydock at Honolulu, 1 September 1915, after she had been raised from over 300 feet of water and towed into port. Note the large implosion hole in her port side, and the salvage pontoons used to support her during the final lift. This view shows F-4's port bow. She is upside down, rolled to starboard approximately 120 degrees from the vertical. Photographed by Kodagraph, Honolulu. USN photo # NH 74733, from the collections of the US Naval Historical Center. Courtesy of Donald M. McPherson, 1972. 2.34k FIRST VIEW OF THE F-4 (SS-23) AFTER BEING RAISED FROM HONOLULU HARBOR. The ill-fated U. S. submarine which sank while making an under water trip through Pearl Harbor, Honolulu, and which sank to the bottom with her crew of 21 men, is seen here in drydock after being raised from the sea. The pontoons which were used in the raising are seen on either side of the vessel. The submarine is lying on her port side and the big hole forward, through which several of the bodies floated out to sea, is plainly seen. Image and text provided by Arizona State Library, Archives and Public Records; Phoenix, AZ & State Historical Society of North Dakota. Photo from Weekly Journal-Miner (Prescott, Ariz.) 1908-1929, 15 September 1915, Image 1 & Bismarck Daily Tribune. (Bismarck, Dakota [N.D.]) 1881-1916, 18 September 1915, Image 6, via chroniclingamerica.loc.gov. 587k The United States Submarine F-4 (SS-23) Which Sank off Honolulu with the Loss of All Onboard towed into Honolulu harbor. Supported Six Feet Below the Surface by Huge Pontoons. The Sailors Have Hoisted the Stars and Stripes Lashed to an Oar. USN photo by Underwood & Underwood, text courtesy of N.Y. Times, 19 September 1915, Page 1, courtesy of memory.loc.gov. 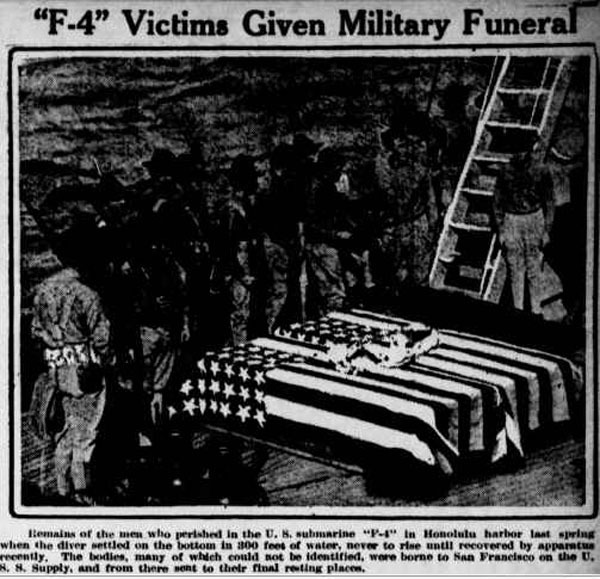 121k F-4 (SS-23) Victims Given Military Funeral. Remains of the men who perished in the U. S. submarine F-4 in Honolulu harbor last spring when the diver settled on the bottom in 300 feet of water, never to rise until recovered by apparatus recently. The bodies, many of which could not be identified, were borne to San Francisco on the Supply, and from there sent to their final resting places. Image and text provided by Washington State Library; Olympia, WA. Photo & text by The Tacoma Times. (Tacoma, Wash.) 1903-1949, 29 September 1915, Image 5, courtesy of chroniclingamerica.loc.gov. 1.15k FUNERAL OF SUBMARINE F-4 (SS-23) VICTIMS. Funeral procession of the mourners of the crew of the American submarine F-4 who perished when the vessel sank in Honolulu harbor, on its way to Arlington National cemetery at Washington. Image and text provided by Louisiana State University; Baton Rouge, LA. Photo & text by The Madison Journal. (Tallulah, Madison Parish, La.) 1888-current, 23 October 1915, Image 3, courtesy of chroniclingamerica.loc.gov. 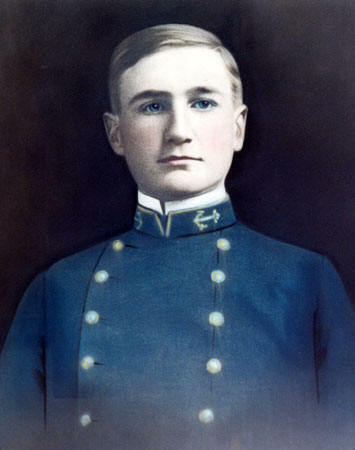 23k Alfred Louis Ede, Lieutenant, Junior Grade (Commanding Officer) of the F-4 (SS-23) at the time of her loss. USN photo courtesy of oneternalpatrol.com. 43k Commemorative photo in memory of the F-4 (SS-23). Photo courtesy of Tom Kermen. 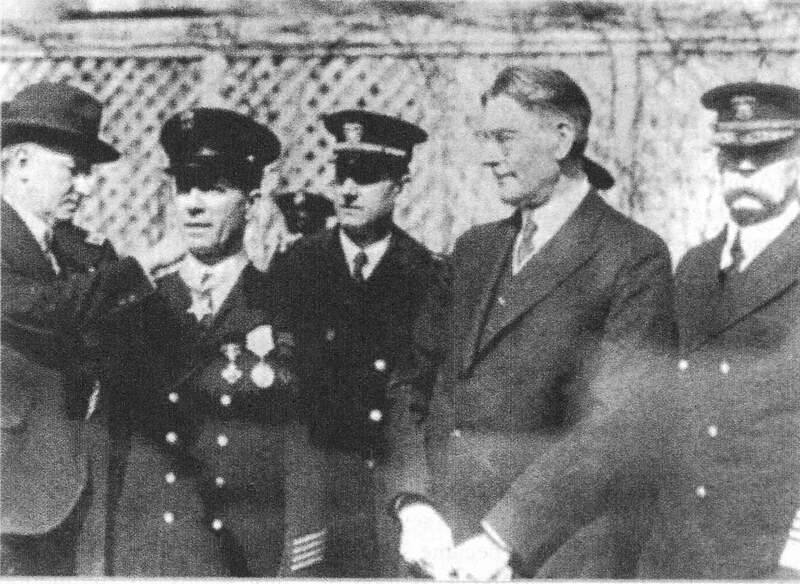 263k President Calvin Coolidge presenting the Medal of Honor to Chief Petty Officer Frank Crilley on 15 February 1929 for his heroism in the rescue of Chief Petty Officer William F. Loughman during salvage operations on the submarine F-4 (SS-23). Left to right: President Coolidge, Chief Crilley, the now-ensign Loughman, Secretary of the Navy Curtis P. Wilbur, and Chief of Naval Operations Charles F. Hughes. Image scanned from Mud, Muscles and Miracles, by Captain Charles A. Bartholomew, USN and Commander William I. Milwee, Jr., USN (Ret.) via Robert Hurst. F-1 (SS-20), F-4 (SS-23), G-2 (SS-27), H-1 (SS-28), O-5 (SS-66), O-9 (SS-70), S-4 (SS-109), S-51 (SS-162), Squalus (SS-192), Scorpion (SSN-589) & Thresher (SSN-593). Photo courtesy of Wendell Royce McLaughlin Jr.
52k Commemorative group photo of the crew of the F-4 (SS-23). "When the waves of death compassed me / the floods of ungodly men made me afraid; / the bonds of She'ol encircled me; / the snares of death took me by surprise; / in my distress I called upon the Lord, / and cried to my G-D: / and he heard my voice out of his temple, / and my cry entered into his ears. / Then the earth shook and trembled; /the foundations of heaven moved / and shook because of his anger /...the heavy mass of waters, and thick clouds of the skies /... And the channels of the sea appeared, / the foundations of the world were laid bare, / at the rebuking of the Lord, at the blast at the breath of his nostrils. / He sent from above, he took me; / he drew me out of many waters; / he delivered me from my strong enemy, and from those who hated me; for they were too strong for me. / They surprised me in the day of my calamity: / but the Lord was my stay / He brought me forth also into a large place: / he delivered me because he delighted in me./"